Australian PM says any deliberate setting of wildfires would be "mass murder"
(CNN) -- Investigators in Australia believe some of the deadly wildfires ravaging dry southeastern bushland may have been set, a conclusion prompting Australia's prime minister to call such acts "mass murder." 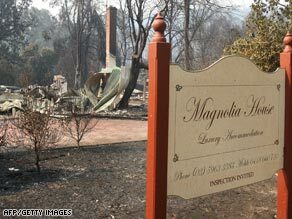 This hotel in Marysville was reduced to rubble. State officials in Victoria have launched arson investigations into some of the blazes, which have killed at least 173 people, decimated massive spans of land and left thousands of people homeless. Nine Network's Tom Steinfort told CNN there were 25 fires still burning out of control Tuesday. Australian Prime Minister Kevin Rudd said Monday: "I think it's important that the nation braces itself for more bad news. This is a little horror which few of us anticipated." "What do you say about anyone like that?" Rudd said. "There's no words to describe it, other than it's mass murder." Wildfires are an annual event in Australia, but the unprecedented carnage wrought by the fast-moving infernos, called the worst ever by police, have shaken and surprised the nation. This year, a combination of factors has made them especially intense: a drought, dry bush and one of the most powerful heat waves in memory. And, finally, officials think some of the fires might have been deliberately lit. The number of dead is exceeding the toll of 75 in the Ash Wednesday fires of 1983, state police said, and the toll is expected to rise. Fire authorities reported nine large fires, including urgent threat messages for two of them. Around 4,500 firefighters are battling the blazes. More than 3,000 people have been displaced. Victoria Premier John Brumby said more than 800 homes have burned and he expects the "devastating event" to push the death toll higher. As many as 400 Australian troops will be heading to affected areas to aid in rescue and recovery efforts, and resettlement services will be provided to displaced families, Rudd said. Firefighters on the scene have been working with other emergency service personnel to cut fire breaks while police erect roadblocks to evacuate residents, Shepherd said. Victoria authorities have banned the use of barbecues and any equipment that might spark a fire. One man has been charged with violating the ban and of "conduct endangering life" in connection with a grass fire, and another has been charged with lighting fires in the neighboring state of New South Wales. As darkness descended Monday, the flames continued to lick the night sky. Aerial views showed rivers of orange trickling in all directions amid the dense vegetation. Police expect that some of the fires will burn for a number of days, while others may take weeks to completely extinguish. Temperatures in parts of Melbourne reached 118 degrees Fahrenheit (48 degrees Celsius) in the past few weeks. Dozens of heat-related deaths have been reported. Officials were hoping for some help from milder weather moving in.